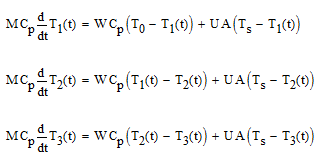 The temperature dynamics are modeled by these three differential equations. The three differential equations were solved analytically to give symbolic equations for the three temperatures T1(t), T2(t) and T3(t) . These equations were then translated into Visual Basic and implemented in Excel. 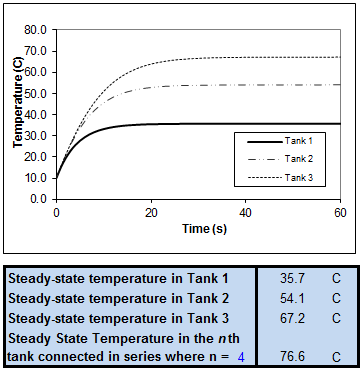 The spreadsheet also gives the steady-state temperature Tn of the nth tank connected in series, as predicted by this equation.